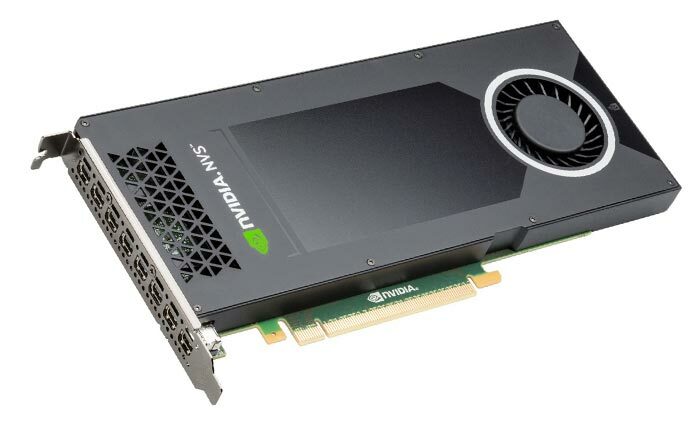 Nvidia has launched a slim new graphics card which aims to power 'massive digital signage displays'. The NVS 810 digital signage graphics card offers eight mini-DisplayPort 1.2 connectors, with each capable of driving a 4K display. Furthermore it is possible to build a system with four of these cards installed to "power massive display walls with extreme screen resolution, enabling a more immersive visual experience". The NVS 810 is the first Maxwell card to be released for this niche. Users can benefit from Nvidia DesignWorks Display features such as Mosaic and Warp & Blend to combine the cards for the greatest impact and for making use of the available displays/projectors to their best advantage. 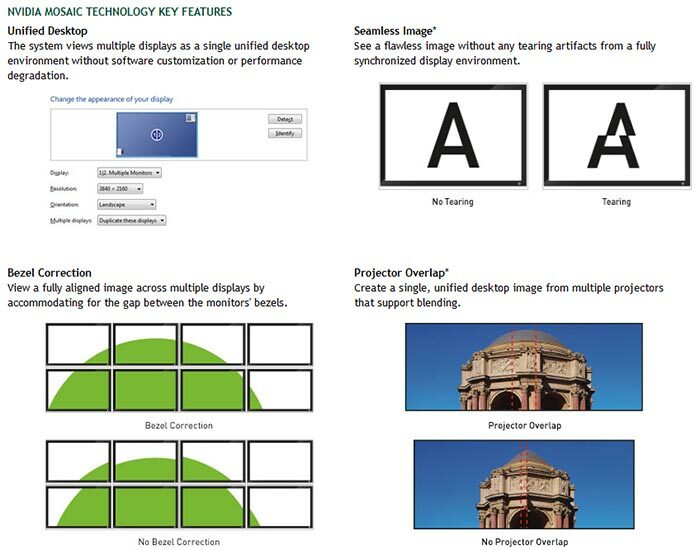 Creating a single desktop across multiple display outputs is said to be "easy" thanks to Nvidia's software. To use a single NVS 810 card to drive 8x 4K synchronised displays you must run your monitors at a refresh rate of 30Hz. Users that insist on 60Hz refresh can only drive 4x 4K displays from one of these cards. What kind of hardware does Nvidia employ in an NVS 810 digital signage card? Nvidia CUDA Parallel-Processing Cores: 1024 (512 cores per GPU), that's two GM107 GPUs as featured in the GTX 750 graphics card series. Nvidia's latest digital signage card gets the thumbs up from Seneca, a technology solutions company. "We are now able to offer customers higher output density with better performance, ultimately increasing the player-to-display ratio while simultaneously lowering installation costs," said Jami McGraw, product development manager at the firm. If you are interested in acquiring an NVS 810 card or two you won't have to wait too long. Nvidia says that PNY branded NVS 810 cards will start to become available in the US and Europe starting this month. Expect to pay about $700 for a single NVS 810 card. Try to run a modern game on your video wall. At 30720x8640. In fact, just run UT on it. Still some serious number of pixels to throw around! That screen res is is 265 megapixels whilst a 4k display is 8.8 megaixels, so a pretty large jump! To be fair this card is never going to do any heavy grunt work such as gaming or real time rendering, this type of card is for shop/sports venue displays etc where they're showing ‘promotional videos’. Got to be honest and say that considering it has 2 ‘gtx 750’ gpu's inside that's pretty impressive to make it a single slot cooler considering most 750's are quite bulky still.